Have you seen the Quick Quack Car Wash Adopt a Highway signs all over the Sacramento region? Quick Quack Car Wash does a great job cleaning, shining and protecting your car with their fast and affordable car wash. They also are committed to keeping the highways clean and helping the environment. 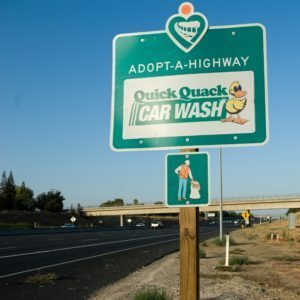 Quick Quack Car Wash has adopted over 14 miles of highway in the Sacramento region and is currently the biggest Caltrans adopter in the area. Thank you Quick Quack Car Wash for being committed to providing such a worthwhile service to our community. This entry was posted	on Thursday, October 27th, 2016 at 4:30 pm	and is filed under Sponsor Highlights. You can follow any responses to this entry through the RSS 2.0 feed. You can leave a response, or trackback from your own site.